When it comes to innovation at affordable prices, there is no company currently on the market that comes close to SMOK. Since its inception, almost a decade ago, this is a company that has always pushed to be at the head of the pack. 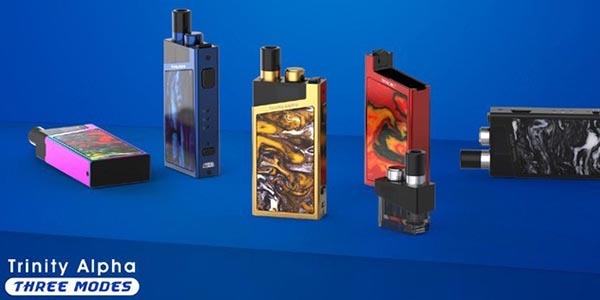 With many of the most recognizable mods in the world already in its back catalog, it has recently unleashed the Trinity Alpha pod style system. From what we have seen, this miniature system packs a mighty punch for its weight class and over the next few minutes we’re going to take a quick look at the device – all the way from the specifications through to the operation manual – so whether you have just picked one up or are thinking about purchasing, you know what to expect in the box. SMOK’s mission as a company is simple, bringing the highest quality devices to the masses at the best possible price point. SMOK entered the vaping market in 2010, hailing from the Nanshan district of Shenzhen City, China under the watchful gaze of its parent company Shenzhen IVPS Technology Corporation Ltd, bringing a wealth of knowledge in research, development and the manufacturing of electronic systems. SMOK has created many firsts in the vaping industry. From creating the sub-ohm tank market, we know today to deliver the earliest full mod kits, this truly is a powerhouse of industry. As a global brand, they sold over 3 million units of a single mod, the Alien, and have shown absolutely no signs of slowing down. As the industry moved from big box mods and killer clouds, SMOK moved along with it and has produced some of the most innovative pod systems currently available. Whether its draw to activate, like the SMOK Rolo Badge, or push button like the Nord system SMOK has made sure to include its signature with every device. One of the main reasons SMOK has been so successful is the vast quantity of style choices it creates with each new device. A wide array of colors and style has always meant that there is a SMOK device for everyone and the Trinity Alpha is no different. While the SMOK Trinity Alpha is only currently available in 6 colors, each one is a tiny work of art. Measuring in at 90mm by 38mm and only 16 mm deep, this is truly designed for stealth vaping. Disappearing into the palm of your hand, no-one would know you were carrying the mod. Crafted from Zinc Alloy with Resin panels on the front and back, they are beautiful little mods. With a battery output of 1000 mAh and a range from 6 – 30 Watts, there is more to this little device than meets the eye. One of the few pod systems currently available that gives you power options for your pods (SOFT, NORMAL & HARD), the Trinity allows you to customize your vaping experience. The pods that SMOK provided for the Smok Trinity Alpha coils are a step above the competition, while others will have you trying to use tiny holes in the bottom of the pod to fill the 2ml tank, SMOK has kept everything about this design as user-friendly as possible. A massive top filling port means that the only time you need to remove the pod is to change the coil, leaving much less chance for leaks and spills. One of the greatest aspects of this pod system is the fact that it borrows its coil technology from the Nord, currently the fastest selling low wattage system on the market. 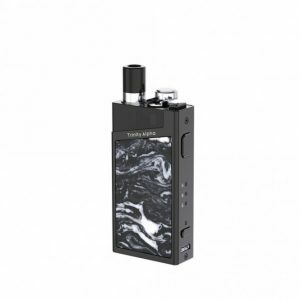 With intelligent battery life indication, fast charging and multiple layers of protection built into the Trinity Alpha, SMOK has used its years of creating killer systems and condensed them into, possibly, the greatest tiny mod ever made. Each Trinity Alpha kit, whether designed for use in the United States or TPD compliant European models pretty much comes with the same contents except for the actual pod size. US models are 2.8 ml while TPD models are sold with a 2ml screw-locking fill cap. Charging the Trinity Alpha: Using the charging cable included, hook the SMOK Trinity Alpha to either a computer USB socket or any 0.5 or 1 Amp charging block. Do not use a fast charging block as this may permanently damage the battery. When you get the device, chances are that it has shipped without a charge, so make sure to plug it in before you try to use it. Where it is only a 1000mAh battery, it shouldn’t take too long to reach full power. The device has a charging shut off built into it, so you can’t accidentally fry the battery by leaving it on the plug. Installing the Trinity Alpha coil: If the pod is already installed, press the pod lock button to release it. Turn the pod over and insert the Nord coil into the large hole in the base and twist it into position. Filling the Trinity Alpha: Filling the device is simple, whether you are using the US or EU version. The filling port is on the top of the pod, next to the drip tip. US model is a push top, sliding open to reveal the port while the EU version requires a little unscrewing. When you have the fill port open, insert the end of your e-liquid bottle and fill almost to the top. Turning the Trinity Alpha On/Off: 5 rapid clicks on the FIRE button will turn the device on/off. Battery Life Indicator: The LED on toward the base of the device tells you how much life you have in your battery. Changing the Power Settings: The 3 LEDs on the side of the Trinity Alpha indicate your current power setting. To switch between SOFT< NORMAL & HARD, use the switch toward the base, over the USB port. Firing the Trinity Alpha: Press and hold the Fire button. If you accidentally hit the button or press it for too long, it will automatically shut off after 8 seconds. We hope that you have found this complete guide helpful, especially if you are currently considering purchasing a SMOK Trinity Alpha kit. It’s a simple to use, stealthy device that has some killer design features that we hope catch on with other manufacturers and become the new norm’s in the industry.